St. George, the most important soldier-saint in the Christian tradition, was born in Lod (Lydda). 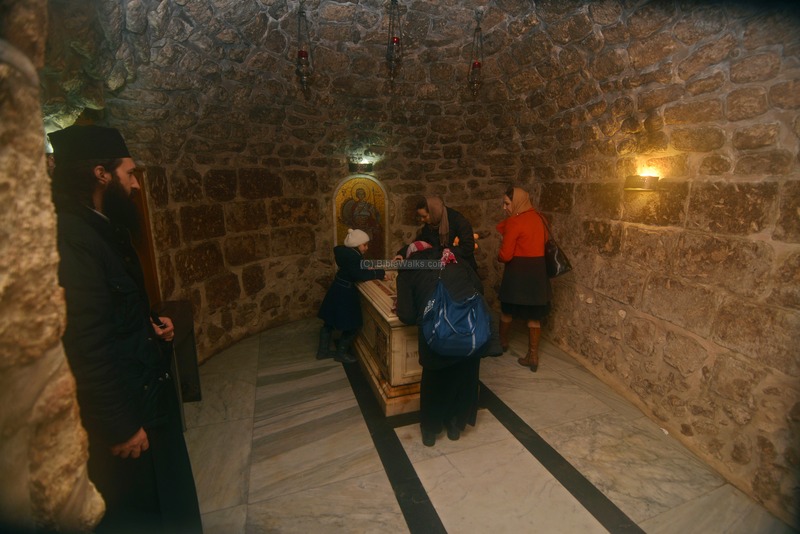 His remains are kept in the crypt of the Greek-Orthodox church. 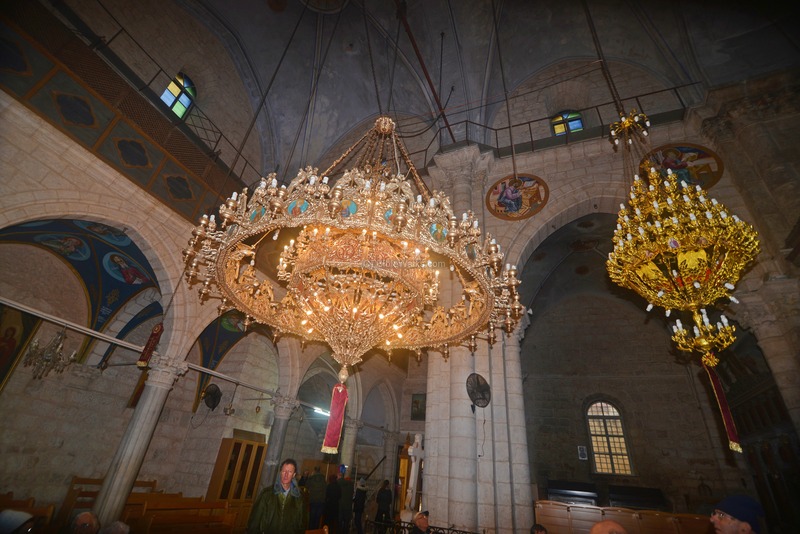 The church was first constructed in the Byzantine period, rebuilt by the Crusaders, and rebuilt during the late Ottoman period. St. George church is located in the old section of the modern city of Lod. 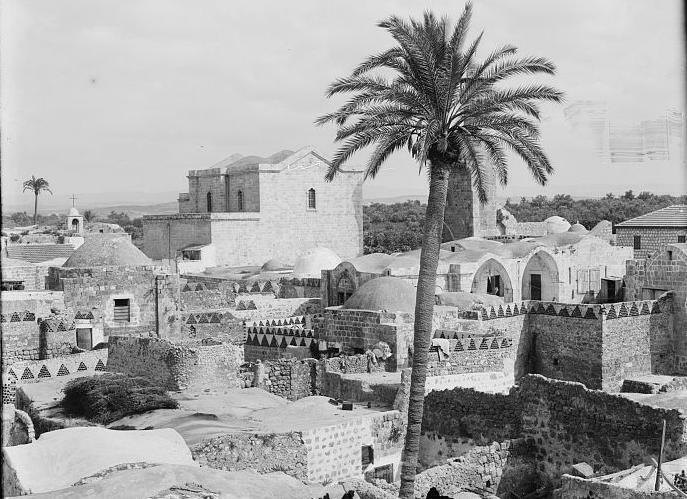 The church, and the adjacent el-Omari mosque, are located near Khan Hilu - the ruins of a Ottoman period inn. To the east and north of St. George was the location of the ancient city of Lod/Lydda, but few remains were left. The Biblical city was located further to the northeast, on the south bank of Nahal Ayalon stream. The following aerial view shows the points of interest on and around the site. Point on the yellow points to navigate to the selected point. 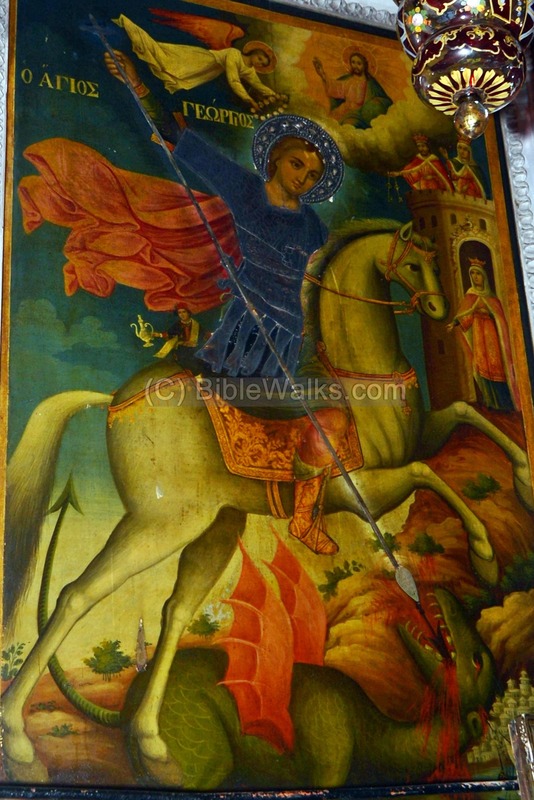 St George was born and lived in the 3rd C AD in the city of Lod (Lydda). George, an early Christian, served as a Roman tribune and died in Asia Minor in 303. He is the most important soldier-saint in Christian tradition since the Byzantine period. According to one of the legends, George was a victim of the last and most severe of persecutions of the Christians in the Roman empire. Diocletian ( Caesar 284-305) issued an edict in 303 AD, instructing that all Christians should be purged from the Roman Army. During the army's roll call in the city he was stationed, Nikomedia, the edict was announced, and George - who until then secretly practiced Christian faith - tore up the letter. This revealed his secret, and the court sentenced him to a gruesome death: George was placed in a barrel, head down, and he drowned from the spit of the 6000 soldiers. George is regarded as a martyr, a great Holy warrior saint, and is also illustrated in all Greek Orthodox Churches as the "dragon slayer". The dragon slaying is based on a tradition, probably told during the Crusaders period, of an event that happened in Lebanon many years after the martyr's death. According to this legend a princess was threatened by a dragon, and George appeared and with great heroism attacked and killed the dragon with a spike. In these illustrations, the princess is seen hiding in a fortress (see example on the right) and George spikes the dragon. This church was dedicated to St George in the Byzantine times. 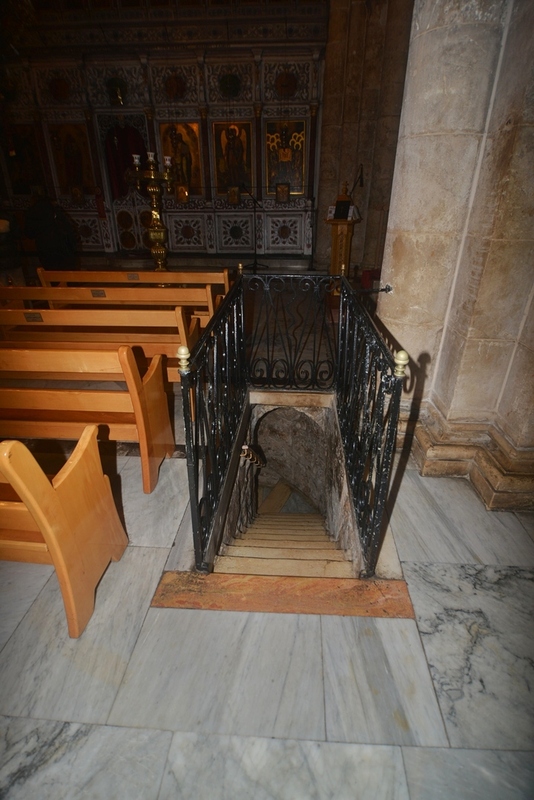 A stone coffin is located in the crypt of the modern church, where according to the tradition his bones are located. 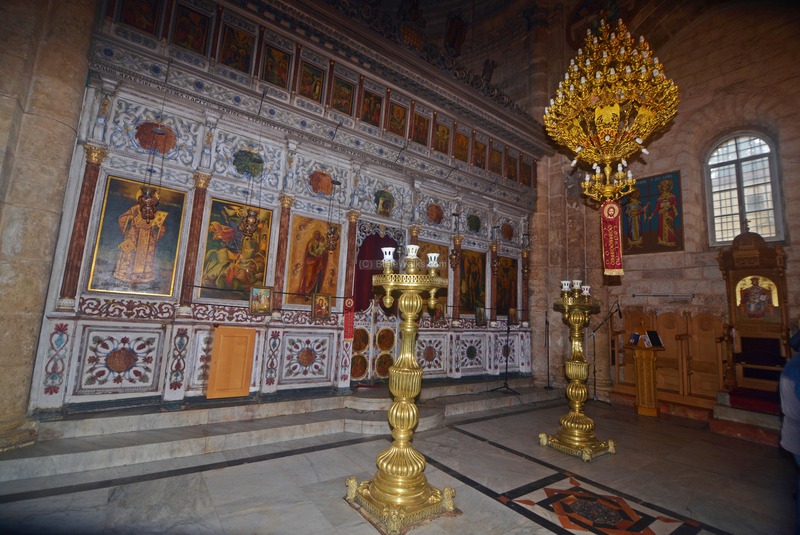 In the Byzantine period the city witnessed a commercial prosperity, thanks to the Christian pilgrims who came to see the city where Peter cured the sick man, and the birth and resting place of St. George. 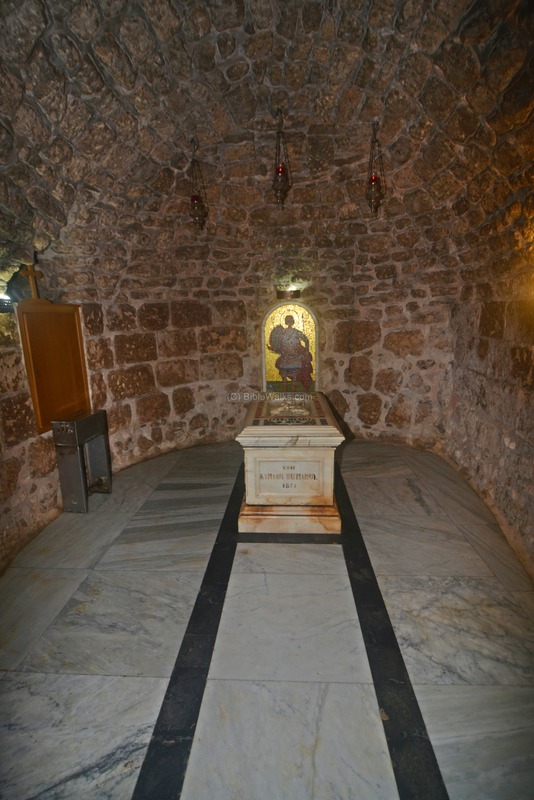 George was venerated (honored as a saint) at the end of the 5th Century. During the 6th Century, a large Church was built over the traditional site of his burial site. Remains of this church can be seen in sections of the adjacent mosque. An ancient map of the Holy Land from the 6th C AD was discovered in 1884 in a Byzantine church in Madaba, Jordan. The map shows the the Holy Land, with dozens of illustrated sites. Lod is illustrated with great details, implying its Christian importance. The Greek inscription above the icon reads "Lod (ΛωΔ) also Lydea (ΛΥΔΕΑ), called also Diospolis (ΔΙΟСΠΟΛΙС). The city is not walled according to this map. The Byzantine church of St. George is shown as a large structure with a red roof. A semicircular roofed colonnaded plaza appears in front of the church. Three houses are adjacent to the south side of St. George. Another roofed colonnaded east-west street appears to the north of the church. Adjacent to it is a second northern church, also illustrated as a a red roof with a cross. Near it is a white structure, or another colonnaded street. The Sasanian-Persians defeated the Byzantines in the battle of Antioch (613) and conquered the land (614). They damaged the Church. After the conquest of Jerusalem and the Holy Land by the Arabs (638AD), Lod became a regional government city and was renamed Lydda. In 716 the Umayyad Caliph Sulayman ibn Abu al-Malik founded a new city nearby, naming it Ramla. This moved the center of power to the new city, while Lod/Lydda was partially destroyed. The church was initially unharmed, as it was honored by the new rulers, who respected St. George and his burial place, as well as other Christian sites. However, the Byzantine church was later leveled by the Arab rulers when their faith became more extreme. The church was destroyed, as suggested by scholars, in 1010 by the Fatimid ruler Al-Hakim bi-Amr Allah (985-1021). This ruler was known as the "Mad Caliph", as he destroyed the Holy Sepulcher in Jerusalem (1009) and all the convents and churches of the Holy Land in the following years. The Crusaders rebuilt the Church in years 1150-1170, fortifying it in order to protect the road to Jerusalem. They renamed it St. Jorge de Lidde. 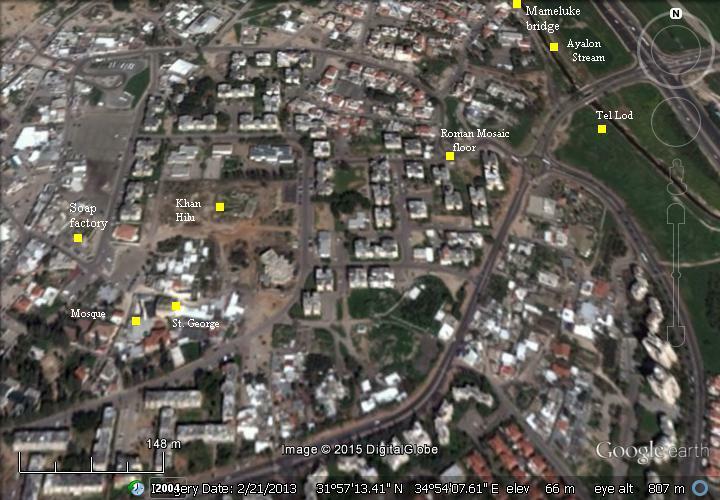 The location of the Crusader church were above the ruins of the Byzantine church. 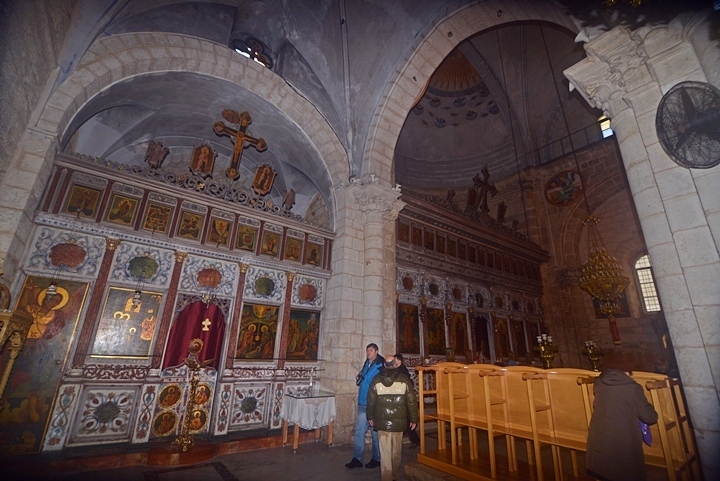 Remains of the Crusader structure can be seen in the 19th Century church and in the adjacent mosque, which reused some of the Crusader structure. Ayyubid conquest: The church was destroyed by Saladin's armies in 1191. A third Crusade, headed by Richard the Lionheart, recaptured the coast line including Lod (1192). St. George became a popular "warrior" saint for the third Crusade. According to legends, the warrior saint helped the Crusaders in their battles. After the Crusaders returned back to Europe, the soldier-saint became popular in many countries in Europe. Richard adapted the emblem of the Cross of St. George - a red cross on white background - and brought this symbol back to England. During the 13th Century the cross of St. George became the national flag of England, and in the late 14th Century St. George became England's patron saint. About 200 English medieval churches were dedicated to St. George. A peace treaty of 1198 gave the Crusaders the right to hold the coast line cities. The Crusaders held this region until 1263. Mosque: In 1268 the Mamelukes built a mosque on the ruins of the Church. It was named El-Omari, as other mosques that were built on top of ruined Churches. Omari (Omar Ibn El-Khattab) was the conqueror of the Holy Land in 638 AD. "Ludd - A small town, standing among enclosures of prickly pear, and having fine olive groves round it, especially to the south. The minaret of the mosque is a very conspicuous object over the whole of the plain. The inhabitants are principally Moslem, though the place is the seat of a Greek bishop resident in Jerusalem. The Crusading church has lately been restored, and is used by the Greeks. Wells are found in the gardens. Ludd is the Old Testament Lod, the New Testament Lydda. The church appears to date about 1150 A.D. The mosque and minaret are noticed by Mejr ed Din, 1495 A.D. The houses are principally of mud. There Is a palm-tree near the church, and figs are also cultivated". "Ludd - The fine Crusading church of St. George, with the small side church of St. James, have been partly rebuilt. The nave and north aisle of the former are now made into a Greek church, two bays of columns being restored. The whole length was originally six bays, but the remainder is now used as the court of a mosque. The south aisle is destroyed, but the base of one column is still visible. This aisle measured 21 feet 7 inches across, and the nave 36 feet, giving a total of 79 feet. The total length is about 150 feet. The southern chapel of St. James is now a mosque. It was planned by M. le Comte for M. Clermont Ganneau in 1874. The true bearing of the church is 90°. 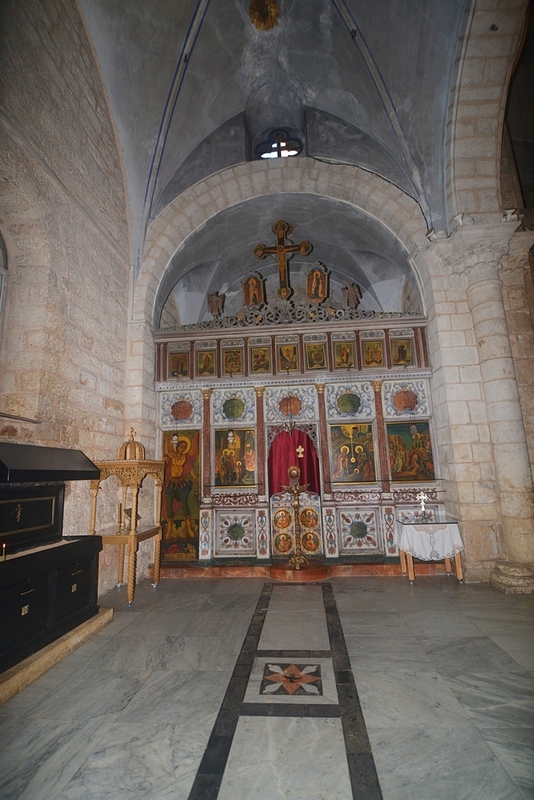 The church dates from about 1150 a.d. and contains a crypt where the tomb of St. George is shown. The diagonal dressing is very marked on the bases of the pilasters. Visited January 18th, 1874". The place had been closed by order of the authorities, and Guerin could not effect an entrance. It would be interesting to make a further examination of this tomb with its headless occupants". During the time of the survey (1874), the church of St. George was still in ruins, as illustrated below. The reconstruction of the Church started in 1870 and was completed by 1893. It was built over the ruins of the Crusader church from 1191. On its south side is the Great mosque (el-Omeri). Many other churches in the Holy Land are also named after St. George, such as in Acre and Jaffa. The church is open to the public. Memorial celebrations are held in St. George annually in April (birth date of George) and in November 15, commemorating the arrival of his bones. St. George is located in the ancient city center. Now most of the old city is gone, and only few remains can be seen around the site. An aerial view, captured by a quad copter, shows the site from the north side. The Church and Monastery are located to the left side of the minaret of its adjacent mosque. This east view shows the Church on the far right side, and the entrance to the Great Mosque (also known as the El-Omeri Mosque) on the closer right side. On the left side are the ruins of a Greek-Orthodox monastery. 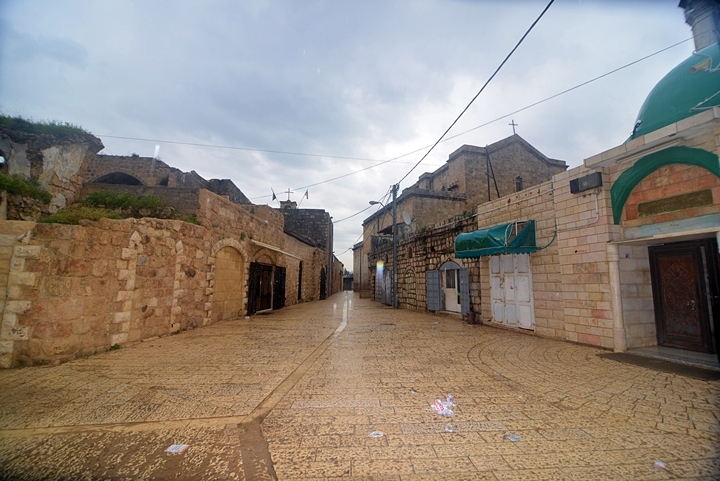 This street was once the main Jaffa to Jerusalem road. 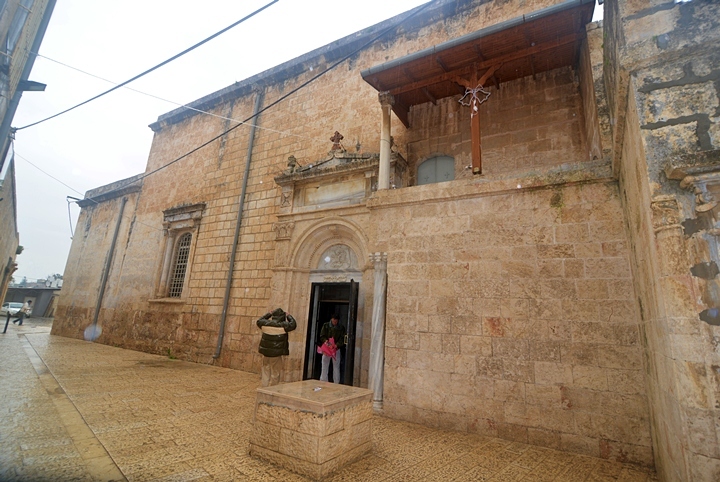 The entrance to the Church of St. George is seen in the following photo. The construction of the present building was completed in 1893. 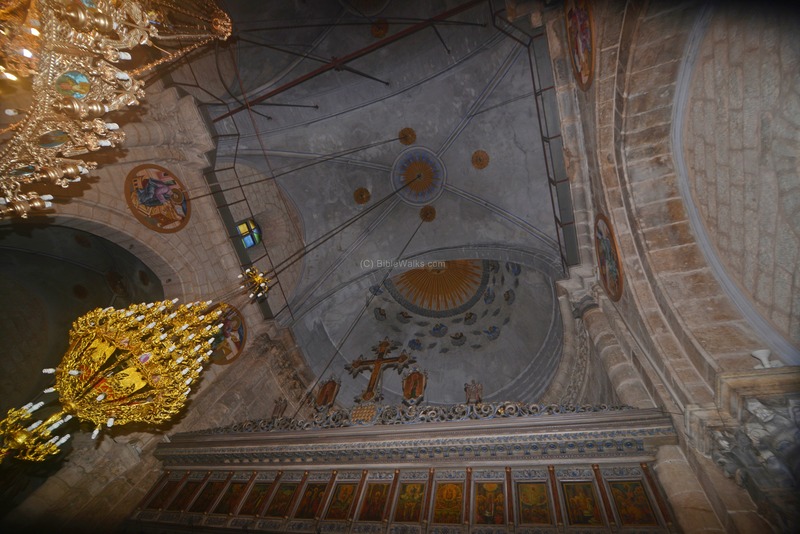 It embedded earlier elements of the Crusaders period fortified church, which protected the road from Jaffa to Jerusalem. The Crusader church was built on the ruins of an earlier Byzantine church. A closer detail of the entrance is seen below. 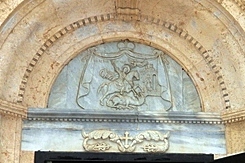 On the marble lintel above the entrance is an illustration of St. George slaying the dragon. An engaged column - the vertical pillar which is partly embedded in the wall - is on the right side of the opening. This is a common Roman architecture element. It reduced the Hellenistic function of the column, once holding the ceiling or an arch, to merely be used as a decorative element. Another marble column is holding the roof of a porch above and right to the entrance. A view of the northern aisle (left) and the nave (right) is seen here. 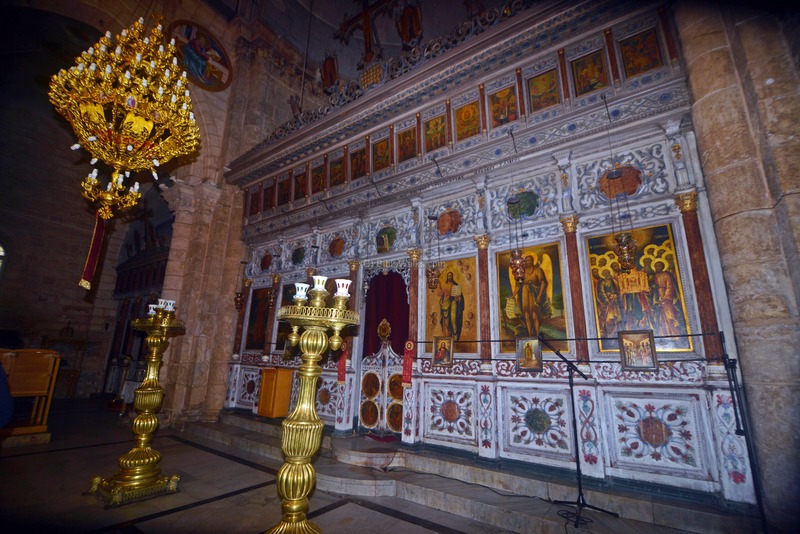 This is a typical Greek Orthodox church, but in this case the southern aisle is missing as it was destroyed during the medieval times and reused in the mosque. The "Templon", also called the iconostasis, is a decorated covered screen with icons and paintings. It separates the hall of the nave and the altar behind the center table. 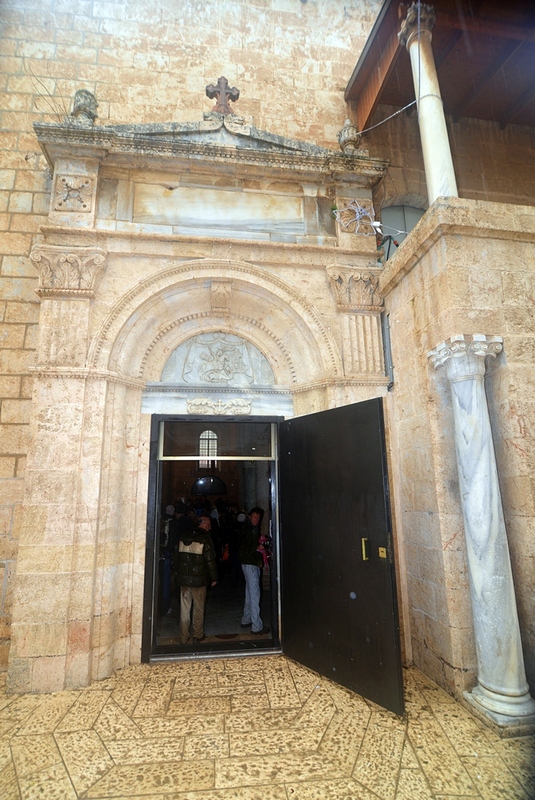 The middle door, called the beautiful gate, is used only by the clergy to enter to the altar behind the templon. The altar faces the east, and the bell tower is located on the west side, as in all Greek Orthodox churches. 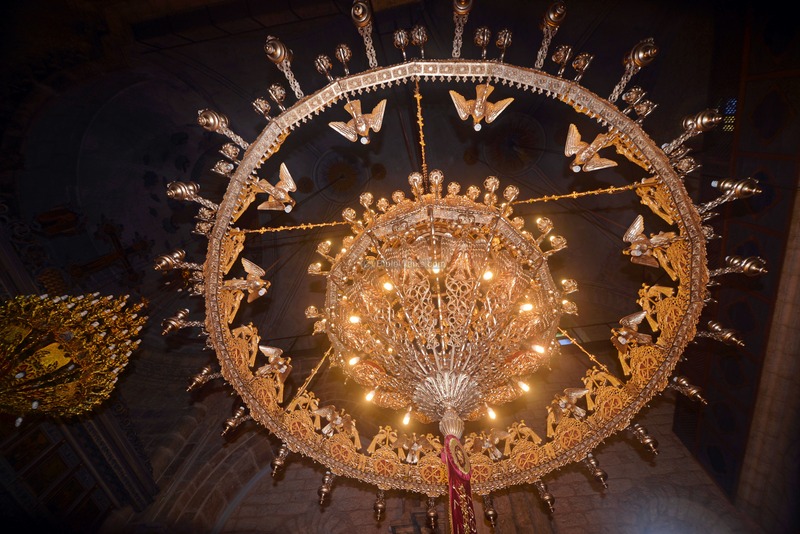 In traditional Greek Orthodox churches the service is performed while standing. Therefore, there are no chairs in the nave, but only a row of stasidia (high-armed chair with arm rests, used for support while standing) located along the wall. Several of stasidia chairs are seen above along the wall. However, in modern times standard benches were added in the center of the hall, as practiced in western churches. Another view of the decorated templon is seen below. Two candlestick holders (manoualia) are standing in front it. Decorated lamps hang down from the high ceiling in the shape of a dome. Another view of the ceiling is in the next photo. 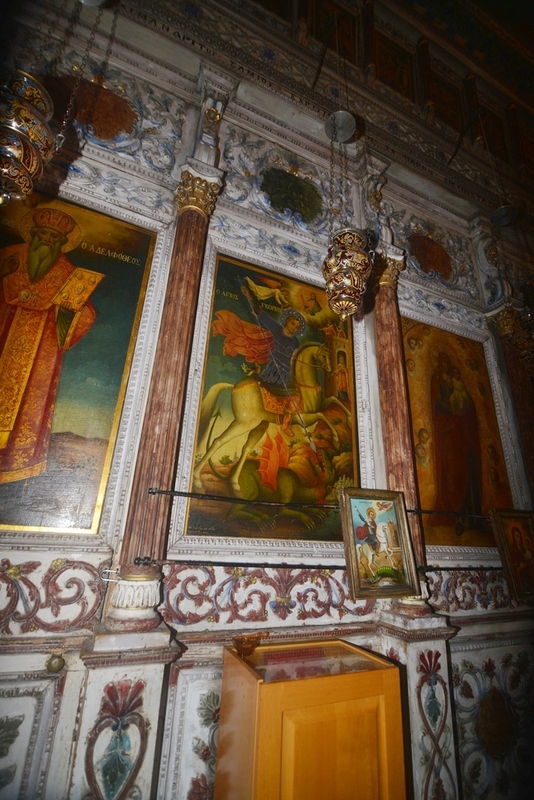 The walls and ceilings are covered with icons and paintings of saints, their lives, and Biblical stories. To the right of the middle door is the icon of Jesus, then John the Baptist. 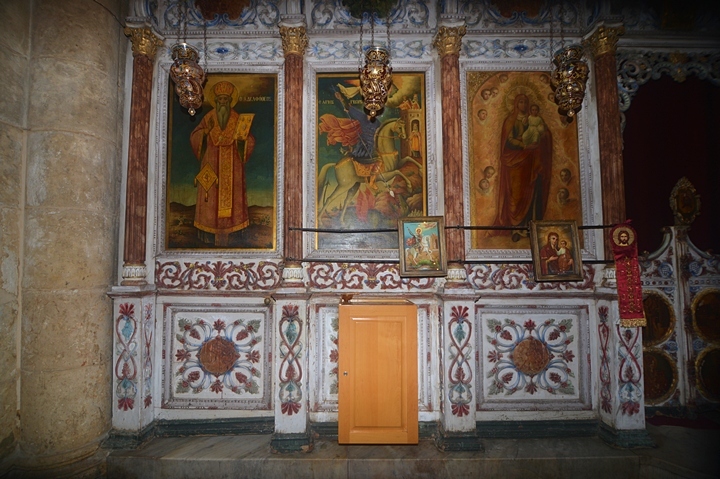 To the left of the middle door, as seen in the photo below, is the icon of Mary (Theotokos) holding infant Jesus, then the patron of the Church (St. George), and on the far left - St. Iakovos (St. James, brother of Jesus). The painting of St. George reads in Greek - "O' Farewell Georgios" - and shows St. George stabbing the dragon with a spike. The angle above him places a crown over the martyr (making George a saint), with the Lord overlooking. A princess hides in her castle, saved from the dragon by the brave Christian hero. Steps on both sides of the main hall leads to an underground chamber - the crypt of the church - where the bones of St. George are buried. 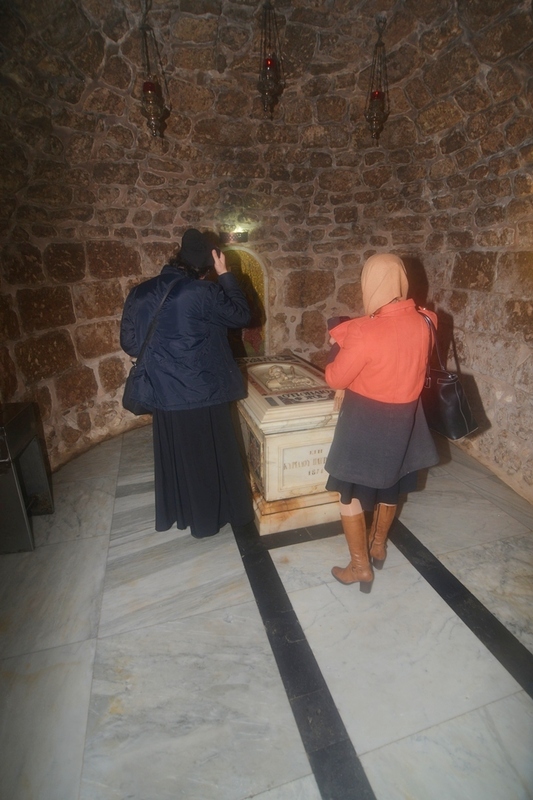 The crypt is dated to the Byzantine period, and the Crusaders and Ottoman period churches were actually built over it. Tradition holds that St. George has curing powers, and so many people, even of Muslim faith, come here to pray and wish for cure of themselves or their beloved ones. In the past, the column on the above right side had iron chains attached to it. The chains held firm the demented people who came hear to seek health from the Holy saint. 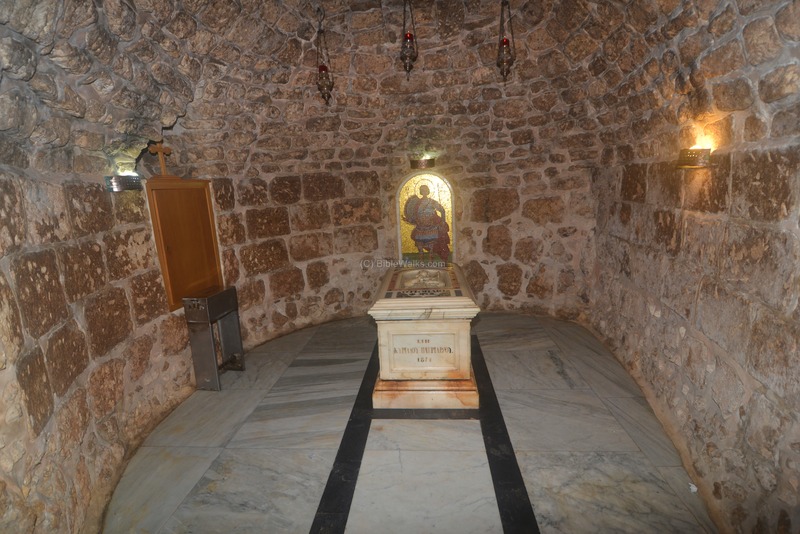 Arabs believed that St. George can cure the mad people, and St. George churches are popular in the Holy Land as they became a sort of madhouse where such patients could be brought back to their senses. The Muslims share the holiness of Saint George as Christians, calling him the "green" (El Khadder) - a nickname also used for prophet Elijah. 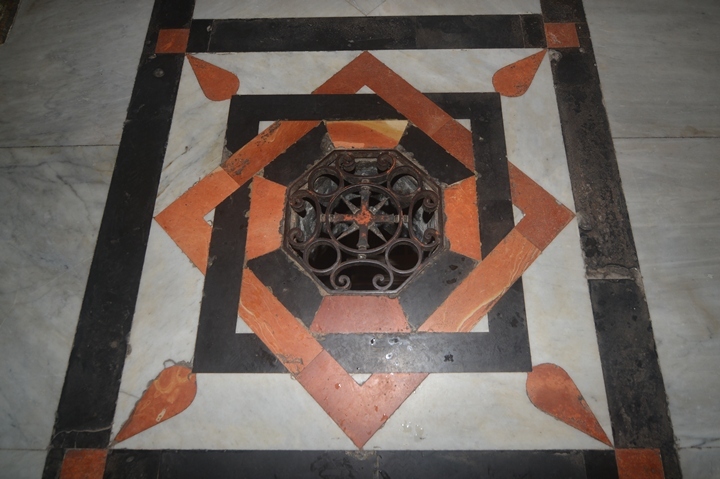 In the next photo is the single chamber in the crypt. In its center is the sarcophagi (tomb coffin) where the bones of St. George are kept. On the 15th of the month, the day of the month when his bones were brought here, olive oil is poured on the grooves of the top of the sarcophagi. Pilgrims who visit the tomb take back with them some of the oil as a Holy relic. On its top of the sarcophagi is a Greek inscription - St. George the carrier of the pike. The date on the front side is 1871 when the bones were brought here to rest. A hole in the center of the nave lets some light into the crypt. 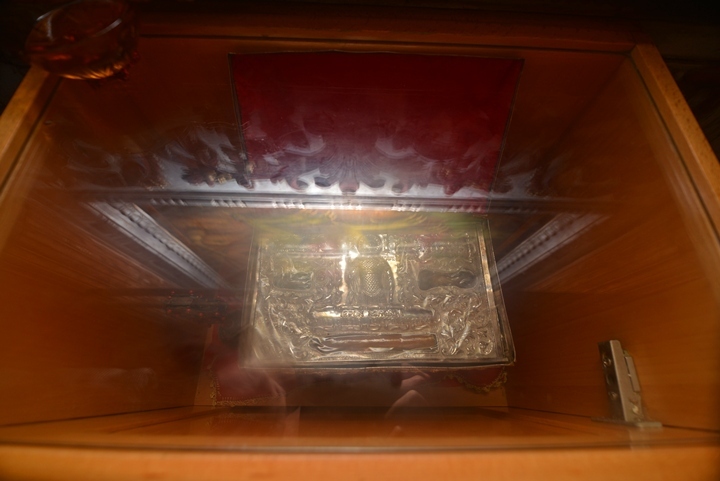 St. George's bones were brought to this resting place inside a box, which is kept in the wooden chest in front of St. George's painting. Inside the chest is the box, or reliquary (container for relics) which held the bones, when they were carried from Asia minor to the resting place in Lydda. St. Georgius - another spelling form. Sarcophagus (sarcophagi in plural) - in Greek - flesh eater. A tomb coffin.